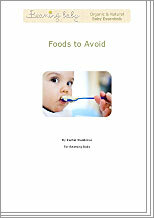 Foods to Avoid, simple list of foods to avoid giving your baby. Baby Care Expert Rachel Waddilove has created some thoughtful advice for baby's dinner time. Some foods are unsuitable for younger babies because their digestive system has not developed enough to cope with them. Other foods are not recommended for babies because they could cause an allergic reaction. Rachel provides a list of all the foods you will need to avoid when feeding your baby. What do you need avoid when feeding your baby?